I’ve never watched anything by her before. She’s very raw and not for the faint at heart. But the show is very provocative and interesting. In the series, she examines four different topics in depth: marriage, racism, Silicon Valley and drugs. In the episode about the Silicon Valley, she examines technology and pitches an app that she came up with to help her get out of bad dates. 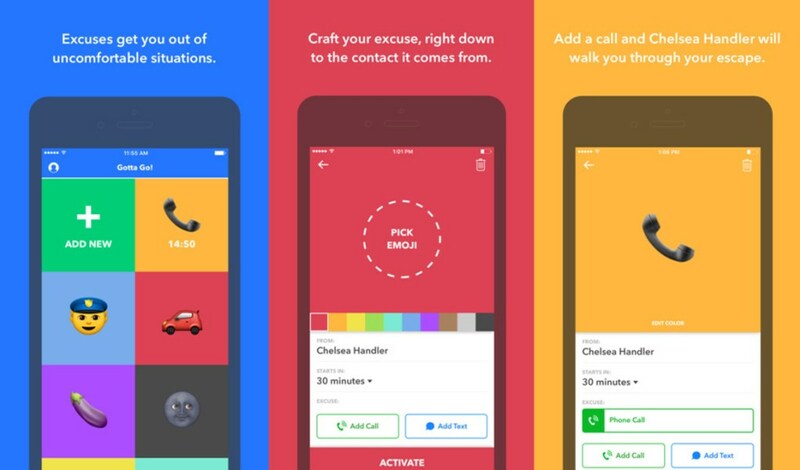 The app allows the user to generate excuses and set alarms for text messages and calls. To use Gotta Go, you tap on the emoji associated with the excuse you want to use, add the contact number to your address book, and set the alarm. Gotta Go would be perfect to use on a blind date when you want to leave early. Or set it up to send you an alarming note to get out of a boring meeting. Hey, I liked my blind date on a Friday the 13th!